Download scary Halloween graphics in vector art format to create spooky invitations, party flyers or posters. 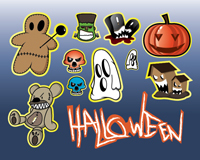 Free Halloween vector packs with tons of bats, pumpkins, witches, ghouls, monsters, spooks and goblins. Cool sets of creepy Halloween vector graphics, icons and clip art saved as Illustrator AI and EPS files. Free vector pack for designers, illustrators and vector artists. As graphic designers or art directors, we know it’s key to collect various creations and images to enhance our designs. Here you can download a large collection of shapes, silhouettes and clip art to use for both personal as professional projects. 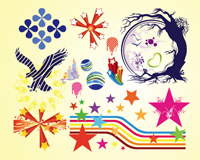 Cool free vector graphics pack with colorful TV-set, stylish tree, hearts, paint splatters, eagle logo, globe symbol, star shapes, abstract clip art and many other vector design freebies for your digital art, print, web or blog projects. 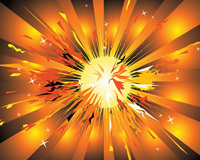 Free vector sunburst background illustration for your graphic design, website, blog or print projects or motion graphics. Download starburst backdrop graphics with sunbeams and explosion effects to create retro vectors, psychedelic images or trendy wallpapers in vector art format. 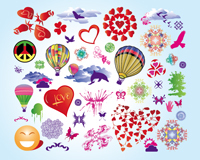 Cool vector freebies set with design elements, ornaments, peace sign, rose buds, colorful hot air balloons, tree, plant and flower shapes, heart graphics, butterflies and birds in the sky, sun, clouds and many more cool design footage for your illustrations and digital art projects. 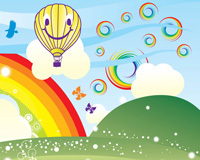 Free outdoor vector illustration with green field, rainbow, clouds, swirls, butterflies and hot air balloon. Field of grass and beautiful sky vector graphics to create grassland, idyllic landscape, meadow, lawn, scene, countryside, light effects, spring or summer weather images. Free social media vector logo graphics pack with icons of the most important social network sites and creative platforms: Facebook, Twitter, LinkedIn, Flickr, Behance, Deviant Art, Design Bump and Design Float. Cool design freebies collection of web and mobile technology vector logos. About Us | Contact Us | Advertise | Terms of Service Vectors1.com © 1995-2013. All Rights Reserved.